A designer checks a 3D-printed wheel of a motorcycle. Manufacturing executives today are confronted with an enormous variety of promising new technologies, ranging from artificial intelligence to connected machinery to 3D printing, all of them offering some combination of cost savings, quality improvements and increased flexibility. It is tempting to think that a manufacturer could modernize itself simply by replacing its old processes with new ones that feature these technologies. But the historical record suggests that isn’t enough. As we describe in our paper The Digital Factory Report, we can turn for an analogy to the late 19th century, when managers rushed to electrify their factories. Electrification seemed like an obvious productivity boost, but it failed to produce any notable gains for more than three decades. Just before 1920, that began to change; gains from electrification accelerated, and it accounted for half of all productivity growth in manufacturing during the 1920s. The Stanford economist Paul David explained the lag between the introduction of electrification and its impact on productivity in his classic 1990 paper The Dynamo and the Computer. The problem, he found, was that managers at first simply overlaid “one technical system upon a preexisting stratum”. 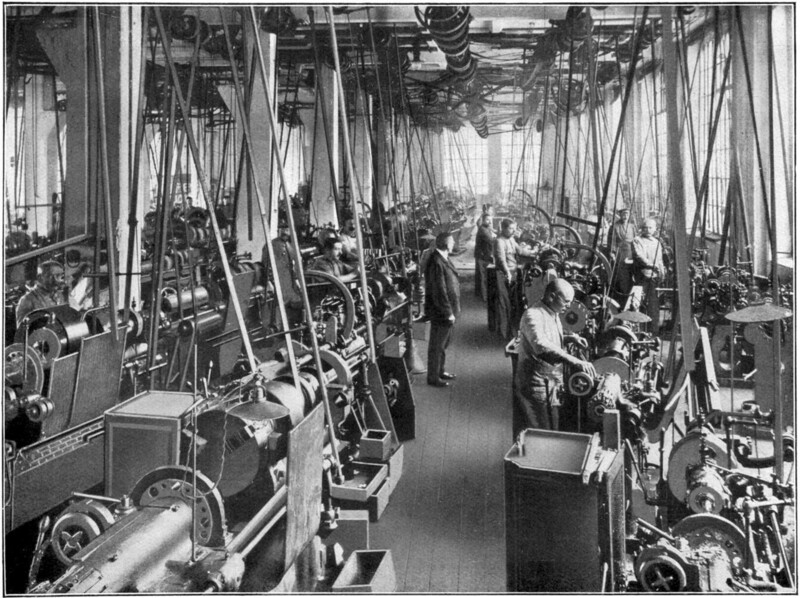 Factories of the late 19th century used “group drive” systems, with a waterwheel or steam engine driving large groups of machines through systems of pulleys and belts. In the first wave of electrification, managers simply replaced the old power sources with new electric motors, which continued to drive large groups of machines through these pulley systems. They enjoyed modest cost savings on fuel as well as slightly improved control, but their factories continued to function exactly as before. A new generation of factories in the early 20th century began to use electrification differently. Rather than installing centralized motors that drove machines through rotating shafts, they began to use “unit drive”, in which a single electric motor is installed in every machine, driving it independently. The advantages of electrification turned out to be profound in ways that early electrifiers hadn’t imagined. Because group-drive shafts lost energy to friction quickly over distance, early factories were arranged around the transmission of power rather than the flow of labor and goods. They needed to be compact to keep machines close to power sources, and any reorganization was a cumbersome process. Factories that used group-drive systems (top) were organized around the flow of power through rotating shafts and belts. They were dangerous, inefficient, and inflexible. The modern factory (bottom) emerged in the 1920s, when a new generation of factory managers built plants with individual electric motors in each machine. The resulting facilities were bright, efficient, and flexible, with layouts that reflected the flow of materials and labor, free from the constraints of mechanical power delivery. 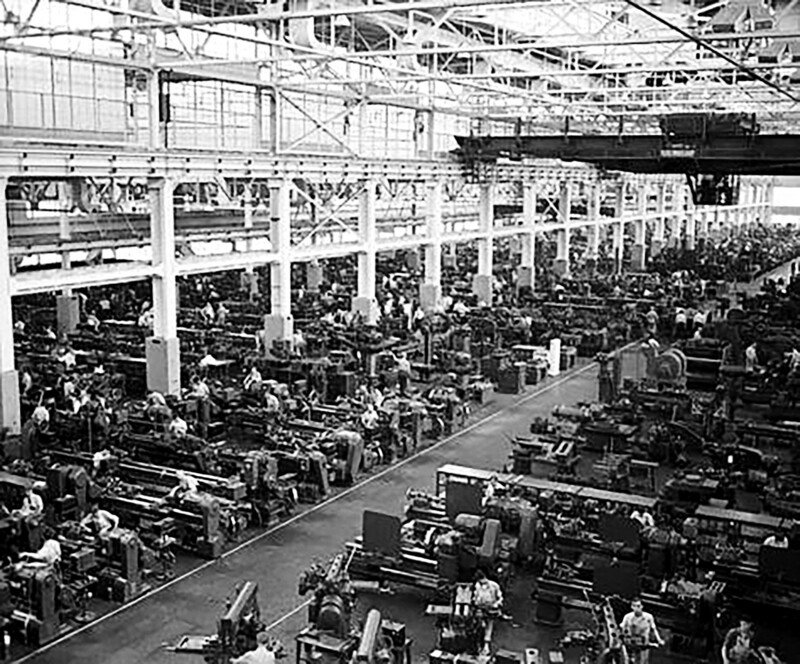 By contrast, the 1920s and 1930s saw the birth of factories that we might recognize as almost contemporary. Without group-drive shafts bolted to their ceilings, factories could be bright, airy facilities with efficient single-floor layouts that could be rearranged quickly in response to market demands. Electrification changed manufacturing, but only after managers became willing to redesign their entire businesses around the fundamental capabilities of electric machinery. Businesses first simply moved individual functions – like payroll, inventory management and accounting – to computers. This led to some modest efficiency improvements, but it was hardly a revolution. The real gains would be realized not from saving a little money on record-keeping, but by reorganizing entire companies and industries around computers. Indeed, from the mid-1990s onward we’ve seen the rise of an entire generation of valuable companies that invented new, fundamentally digital business models around computers and networking. Today’s manufacturers are in a position similar to that of the semi-digitized businesses David described in the early 1990s. Individual technological solutions are available for a wide range of problems that manufacturers experience: artificial intelligence can save worker costs on tasks like quality assurance; connected machinery can reduce downtime by warning of maintenance needs in advance; and 3D printing offers rapid prototyping, flexible production, and savings on small- and medium-run manufacturing. Manufacturers that adopt these technologies without a plan for reinvention will wind up like the 19th-century textile mills that electrified by replacing a single steam engine with a single electric motor, earning only incremental improvements and failing to realize the full value of new technologies. We lay out the technologies that are most likely to transform manufacturing in our new paper, The Digital Factory Report. They fit into three broad fields – artificial intelligence, additive manufacturing and connected machines/intelligent robotics – and, crucially, each is attached to several new business models that are built around the emergence of the technology. Mass customization, in which products are designed and fabricated around individual consumers. The first applications have emerged in high-value fields such as medical devices, but decreasing costs for digital fabrication technologies promise to bring mass customization to lower-value products, including consumer electronics, apparel and athletic equipment. Example: Align Technology, which has treated more than 5 million orthodontic patients with its Invisalign dental aligners. Align recognized that digital production, beginning with a 3D scan of a patient’s mouth and continuing with a 3D printing-based manufacturing process, could help it consolidate a national orthodontic business from what had previously been a fragmented market that depended on artisanal fabrication techniques. Continuous product development, in which physical products are constantly refined in order to offer improvements or address new markets. We take for granted that software, especially when it lives in the cloud, is improved continuously. But it is much more onerous to change a physical product, given the cost and complexity of retooling, so they tend to evolve through occasional major product releases. The inherent flexibility of digital manufacturing reduces product-development and retooling costs and makes continuous product development possible. Example: Airbus uses over 1,000 3D-printed parts in its newest airliner, the A350-1000. Some parts are structural, but most are non-critical wiring harnesses and air ducts that must be reconfigured whenever a modification is made to the layout of the cabin. By 3D-printing these components, Airbus avoids retooling costs and supply chain disruptions; meeting a customer demand for a new cabin configuration only requires a digital redesign. In theory, Airbus could update its cabin layouts for every single airplane that rolls off the production line. Digital supply chains, which combine digital design files with flexible, automated production facilities that are able to fabricate them. By making distributed manufacturing feasible and cutting inventory requirements, they reduce supply chain cost and risk, and make it possible to serve markets in ways that would not otherwise be feasible or cost-effective. Example: Deutsche Bahn, the German railway operator and global logistics provider, found that 50% of the replacement parts it requires to maintain its trains can be 3D-printed. By using 3D printing to fabricate replacement parts for its trains, Deutsche Bahn reduces its costly inventory of spare parts, currently worth €600 million, increases dependability, and brings flexibility to the railroad’s fleet planning by making it possible to operate trains, some of which are 50 years old, without long-term support from their original manufacturers. Digital supply chains also offer a way to respond to the emerging global tariff regime: product specifications can be transmitted digitally to distributed factories, which can produce them for local markets without exposure to tariffs. When new manufacturing technologies emerge, it’s easy to think about them in terms of concrete applications—the requirements they’re able to meet, the kinds of products they’re able to fabricate. But the real returns go to those who are able to build new business models that stand on top of them, and are willing to reorder entire industries around them.